Polio in Pakistan: Who’s to blame? 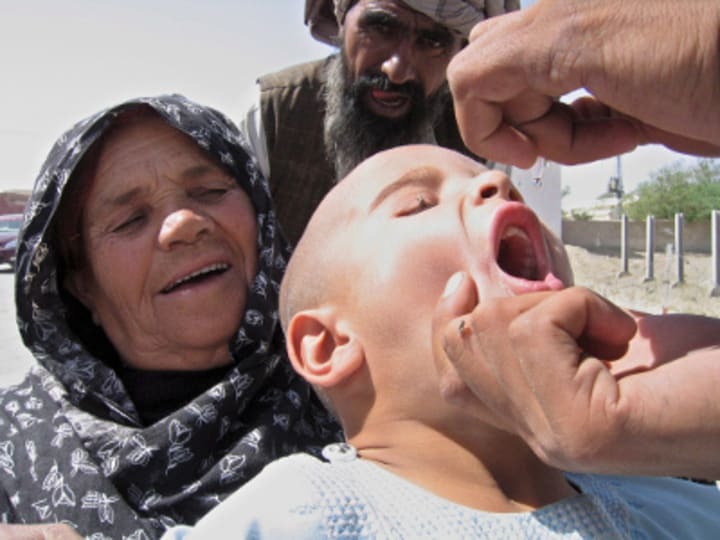 Hundreds of thousands of Pakistani children will go unprotected against polio after the Taliban banned vaccinations anew. A planned three-day campaign to reach 1 million children in Pakistan’s Federally Administered Tribal Areas had to be postponed Monday (July 16) following the Taliban’s ban on inoculations in North and South Waziristan, and Khyber’s Bara district. The ban comes a month after a Taliban leader barred UNICEF from vaccinating more than 160,000 children in North Waziristan. The Taliban issued the ban on both campaigns in protest of U.S. drone strikes, arguing more people could be helped by halting the attacks than through vaccines. They also claim immunization campaigns are used as fronts for Western infiltration and spying — not a completely groundless accusation following the Central Intelligence Agency’s use of a hepatitis vaccine program to get Osama bin Laden’s family’s DNA and the subsequent arrest of the Pakistani doctor who assisted. But immunizing children in Pakistan wasn’t easy even before the terrorist group’s ban. Fighting, cross-border movements and inaccessibility undermined efforts to combat the disease, which remains endemic only in Pakistan, Afghanistan and Nigeria. Access, however, was only the most tangible problem in a cauldron of factors hindering immunization. Polio also saw resurgence in areas where access was not a problem, indicating there were other causes behind the disease’s continued toll, according to Sania Nishtar, founder and president of Heartfile, Pakistan’s top health nongovernmental organization and think tank. Organized factions within Pakistani society effectively orchestrate refusals, saying vaccines are forbidden in the Quran or Western ploys to cause sterilization among Muslims, Nishtar said. This indoctrination has been going on for years and years. Any health initiative seen as coming from the West is viewed with suspicion. Political groups endorse these messages to gain popular support, and the influential local media helps spread the misinformation like wildfire. “When you have three parliamentarians coming on national television one after another talking about polio vaccines causing paralysis and them not being safe and expired and so forth, it accentuates that mistrust that years of indoctrination by the clergy has actually achieved,” Nishtar said. Commercial interests are at stake for those who want to get a piece of the polio-money pie. A lot of vaccine procurement is done through a process involving UNICEF, the World Health Organization and GAVI Alliance. But many traders want to see the system fail so that they can offer to procure vaccines themselves, Nishtar believed. These traders approach politicians and tempt them with offers of splitting what funds they’ll no doubt pinch off the top. A health system riddled with inefficiency and corruption and wholly unable to deliver is also to blame: People grow suspicious when they see mothers dying in childbirth, schools empty of teachers and basic rule of law unenforced, and yet a highly active government presence in efforts against polio. The government of Pakistan has declared fighting the disease a priority, and spends a huge amount of its human resources in the field on anti-polio efforts. “When it comes to polio the entire organizational machinery of the government is really behind the wheel,” Nishtar said. Pakistanis often don’t realize it is part of a global commitment, and don’t see the palpable benefits of immunization. That commitment has resulted in a lot of money being sent into Pakistan to combat polio. The unfortunate but predictable result has been the establishment of organized channels where resources are pilfered at every step — what Nishtar termed a “polio economy.” Officers at every level charge sums to perform tasks, and that is only if they actually exist — “ghost” officers go door to door to carry out campaigns but in reality exist only on paper. Only their salaries and fees exist in real life. This ghost phenomenon in service delivery is common in Pakistan. Primary health care facilities are even the covers for nonexistent physicians who don’t work but charge for procedures, medicine that is never delivered but must be paid for, equipment that arrives only as receipts. And with polio this is exacerbated because there is a lot more money flowing, Nishtar said. At a time when donors are trying to quit micromanaging local implementation of aid projects, Pakistan needs just the opposite, according to Nishtar, who argued for increased oversight and management. She said multilateral organizations that have complex relationships with the government don’t want to confront it on these issues, but should. Jennifer Brookland is a Devex global development reporter based in Washington, DC. She has worked as a humanitarian reporter for the United Nations and as an investigative journalist for News21. Jennifer holds a bachelor's in foreign service from Georgetown University and a master's in journalism from Columbia University and in international law and diplomacy from the Fletcher School. She also served for four years as an Air Force officer.